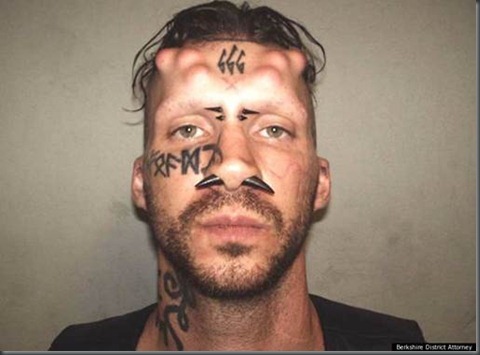 Mugshot of the week……. | Coptalk.Info - What you do not know will shock you! Caius Veiovisv has a lot on his mind … on his head … in his head? 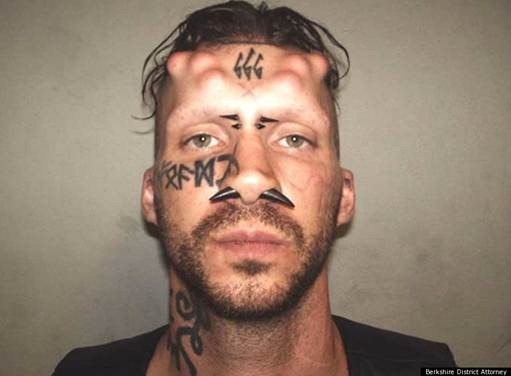 The "666" tattoo and horn piercing decorating this murder suspect’s nose come off as an understatement compared to the bulging round implants protruding from his skull in this unforgettable mugshot. The UK’s The Sun newspaper called the image, "one of the most frightening mugshots ever"
Unfortunately, though perhaps not surprisingly, the charges against Veiovis are as alarming as his photograph. According to the Massachusetts newspaper The Republican. Veiovis, 31, along with Adam Hall, 34, both of Pittsfield, and David Chalue, 44, of Springfield, were arrested over the weekend and charged with the kidnapping and murder of three Pittsfield men: David Glasser, Edward Frampton and Robert Chadwell. The three men had been missing for nearly two weeks, and their bodies were discovered in a trench at an undisclosed location Saturday, according to Berkshire District Attorney David F. Capeless.